It is the secret that many who have been following the 6 year Syrian crisis have always known. Today a big mainstream media outlet blew the cover off of the best, worst kept secret in geo-politics. 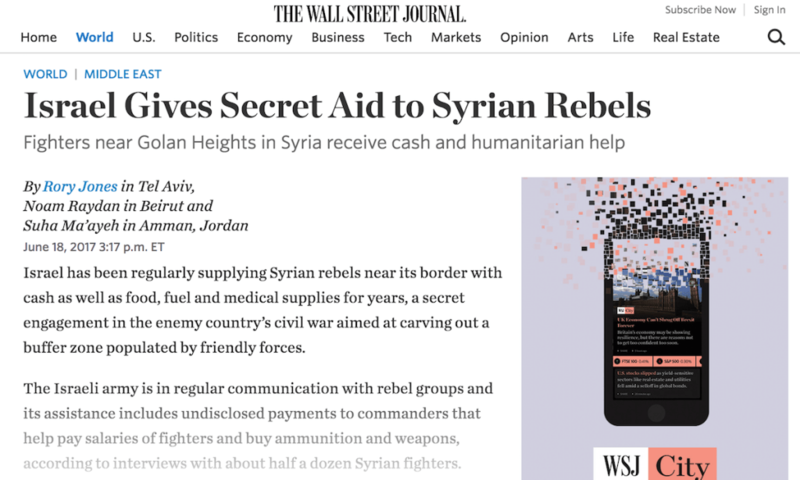 According to the Wall Street Journal, Israel and Saudi Arabia have been aligned from the very beginning of the Syrian conflict, providing money and arms to Syrian rebel groups (aka ISIS and Al Qaeda). Al-Joulan is the main rebel group coordinating with Israel, according to fighters. It told the WSJ that Israel’s support began as early as 2013 under former Defense Minister Moshe Ya’alon, with the goal of creating a ‘buffer zone’ free of radical militants such as Isis and Iranian-allied forces along Israel’s border. A special Israeli army unit was created to oversee the costly aid operation, the WSJ reported, which gives Fursan al-Joulan – Knights of the Golan – an estimated $5,000 (£3,900) a month. The group of around 400 fighters receives no direct support from Western rebel backers, and is not affiliated with the Free Syrian Army, the official rebel umbrella organisation. 2011:Syrian uprising against Iran-backed President Bashar al-Assad begins. 2012: Syrian rebel group the Yarmouk Martyrs Brigade, which has a presence in the divided Golan Heights near Israel’s border, forms and later declares allegiance to Islamic State. It then joins with other groups to form the Khalid ibn al-Walid Army, an offshoot of Islamic State. 2013: Israel acknowledges it is treating Syrians wounded in the war in hospitals near the border. Secretly, the military begins to build a relationship with rebel commanders on the Syrian side of the Golan and starts sending aid. January 2015: An alleged Israeli airstrike kills Hezbollah militants and a general in Iran’s Islamic Revolutionary Guard Corps near Quneitra province in the Golan Heights. Israel later says the militants were planning to attack Israelis. June 2015: Israeli Defence Minister Moshe Ya’alon says Israel is helping Syrian rebels with medical treatment in return for assurances they won’t attack the Druse—a religious minority group that straddles the Israeli and Syrian sides of the Golan. September 2015: Russia enters the war on the side of the Assad regime, tipping the balance of power in favor of the Iran-backed president. December 2015: Lebanese Hezbollah militant Samir Kuntar dies in an alleged Israeli airstrike in Damascus suburb. Israeli officials later say he was planning attacks against Israel from the Syrian side of the Golan. 2016: Israel secretly sets up an army unit and budget to manage relationship with rebels and civilians on the Golan Heights, say people familiar with the policy. The WSJ also notes that Israel may be funding four more rebel groups which have Western backing. In other words Israel is pouring cash into the coffers of all kinds of terrorist groups in Syria with the help of the US and EU. The groups use the cash to pay fighters to buy arms, which flood into Syria, in an effort to topple Assad and raise a black ISIS flag over Damascus. The alliance reportedly began after wounded Fursan al-Joulan fighters made their way to the border and begged Israeli soldiers for medical assistance. Israel and Syria have technically been in a state of warfare for decades. 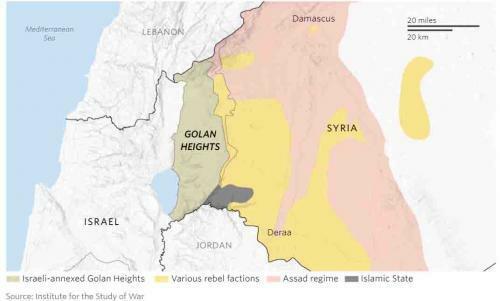 Syria controls around one third of the Golan Heights border, and Israel occupies the rest. Israel has been providing Syrian rebels with cash and supplies in a secret engagement to carve out a friendly buffer zone. In recent years, Israeli air strikes in Syrian territory have aimed to prevent weapons smuggling to Iranian-allied Hezbollah, which fights alongside the Assad government. Hezbollah, like Iran, is committed to the destruction of the Jewish state. Ironically, while Assad has in the past claimed – correctly it now turns out – that Israel supports rebel groups which his government refers to as terrorists, elements of the opposition have accused Israel of helping to keep the regime in power. The biggest irony, of course, is that virtually for the entire duration of the Syrian conflict, Israel and Saudi Arabia were aligned on the same side against the Assad regime; it also means that one can now also add Israel to the ungodly proxy war in Syria alongside Saudi Arabia, Qatar, the US, Europe and most Arab states across from Iran, Turkey, Russia and, increasingly, China. Today’s revelation may also explain why ISIS has rarely if ever launched attacks against Israeli citizens or on Israel territory. We recorded evidence of Obama’s collusion with Russia, and NOBODY CARED!